Metropolitan JOSEPH, was consecrated to the Holy Episcopacy on June 30,1991 at St. Mary Cathedral in Damascus, after many years of serving as a deacon and priest. His Eminence was born in Damascus, Syria in 1950. He completed his basic schooling at the St. John of Damascus and Al-Assiyeh schools in Damascus and then at Our Lady of Balamand Monastery in Koura, Lebanon. He completed his undergraduate studies at the Lebanese University in Beirut and then earned his Master of Theology (M.Th.) with special studies in music and languages from Aristotle University in Thessaloniki, Greece. 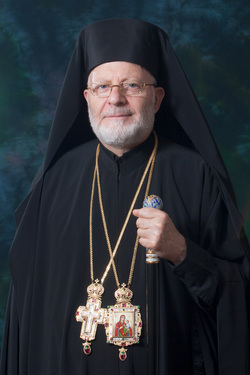 He was awarded an honorary Doctor of Divinity degree from St, Tikhon Orthodox Seminary in South Canaan, Pennsylvania in May, 2010. With the blessing of Patriarch Elias IV of blessed memory, Metropolitan Panteleimon (Rodopoulos) ordained him to be a deacon on December 4, 1976 in Thessaloniki, Greece, and Patriarch Ignatius IV, of blessed memory, ordained him priest on December 10, 1980 in Damascus, Syria. The priest Joseph served as dean of St. Mary Cathedral in Damascus and as overseer of Holy Cross Church and other parishes in the suburbs of Damascus. He served as superintendent of the secondary school in Damascus from 1980 until 1983. He then went abroad to pastor the Antiochian Orthodox Church in London, England, from 1983 to 1986 and the Antiochian Orthodox Church in Cyprus from 1986 until 1991, when he was elected to be a bishop. Metropolitan JOSEPH 's achievements in apostolic ministry over the course of almost 20 years of diakonia as Bishop of the Diocese of Los Angeles & the West, as well as the locum tenens of the Diocese of Eagle River & the Northwest, form a solid testimony to his spiritual, ethical, and personal leadership qualifications. Over this vast expanse of the western United States and Canada, including Alaska, Metropolitan JOSEPH has tirelessly and unrelentingly maintained a personal apostolic presence in the more than 60 parishes under his care. His Eminence has maintained a personal culture of contact, by direct phone, with all his clergy. Many of the clergy and laity testify that Sayidna always remembers and acts on any important issue placed before him. This unique combination of traits, sobriety and blameless familiarity form the bedrock for his personal effectiveness with all. Based upon his solid spiritual, ascetical, intellectual, and cultural formation and education, His Eminence has effectively established solid and meaningful Annual Clergy Seminars, and deepened the spiritual and educational experience of both clergy and laity at the annual Parish Life Conferences. He has brought in many and diverse Orthodox authors, leaders, and teachers to enrich the clergy and the laity of his two western dioceses. This has served to promote a strong sense of clergy brotherhood, inter-parochial exchanges, and has become the envy of other Orthodox jurisdictions everywhere. Guest speakers and visitors constantly remark that Metropolitan Joseph's clergy are outstanding in their consistent and active involvement in such events. His Eminence has labored intensely to deepen the spiritual life of his clergy, by encouraging frequent confession, personal prayer, continual education, and a heightened sense of the fullness of our Orthodox Christian tradition of interior and ascetical transfiguration in Christ. His Eminence has demonstrated episcopal hospitality in his way of life and has led the way in cultivating an active pan-Orthodox community in the western United States and Canada. All of the canonical Orthodox hierarchs of the West relate to Metropolitan Joseph in a personal way as an episcopal con-celebrant. This episcopal brotherhood has increasingly been reflected in the inter-parochial interaction of the priests and laity of all the parishes, across the western states and provinces. Metropolitan JOSEPH has taken care in establishing a strong, clear,and straightforward liturgical guidance for all his parishes. He pioneered the use of the internet in publishing the entire text of all the Sunday and festal services of the Church throughout the year. His love for the divine services inspires him to improve the liturgical praxis of all the clergy, through constant interactions and special teachings. In addition, he constantly promotes the spiritual climate of the dioceses under his care with such things as "the thought of the day." Sayidna Joseph is fluent in English, Arabic and Greek and is conversant in other European languages.